Amidst all the patriotic furor this centenary, the real history of the war is all too easily forgotten. The government and the opposition alike cry crocodile tears for the fallen and mouth “Never again!”, while daisy cutters are dropped on Afghanistan and the history books are (re)re-written. In high-school classrooms and history-books, we are taught a version of the war in which a well-fed, well-bred (and mostly white) nation proudly sacrifices its sons for the lofty ideals of “God, King and Country”. The little mention made of wartime dissent is limited to a few footnotes about ‘conscientious objectors’ who are presented as a tiny minority of isolated idealists, and perhaps a few comments on the rising cost of living. This version of history was written by the ruling class, for the working class, to create a placid and pliant society that allows the prosecution of future wars. The real history of the war is somewhat different. In New Zealand, there was a great movement against the continued prosecution of the war, and for peace. It wasn’t a minority, and it wasn’t isolated. Hundreds were jailed, and thousands condemned the war in public meetings, in their workplaces, and on the streets. This article tells just part of that story, the fight against conscription. The labor movement, organized in the unions and socialist political parties, opposed conscription from the start. Early warning of the government’s intent was heralded by the establishment of a National Register in 1915. All men over the age of 19 were required to register. Despite the government’s assurances that the register was not part of preparations for conscription, only men of military age (19-54) had to answer questions as to their willingness for military service. 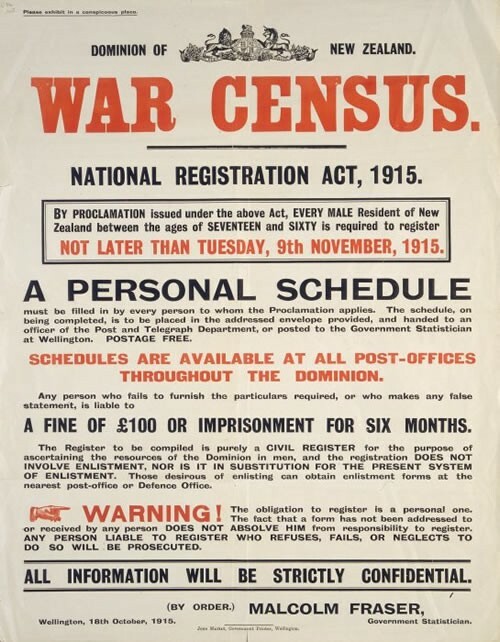 The result showed a clear majority of ‘eligible’ men were against conscription, something the labor movement was quick to point out in its newspapers and publications. Of 195,341 respondents, 33,785 were totally unwilling to serve in the armed forces, and an additional 44,338 would not serve overseas. A total of 137,807 respondents were married and/or had dependents, leaving only 34,103 men willing and available to serve without qualification. A small minority by any terms. Auckland Bricklayers, Wellington Shipwrights, Wellington Painters, Auckland Iron and Brass Moulders, Westport General Labourers, the Amalgamated Society of Carpenters and Joiners, the Otago Labour Council and even the Woolston Borough Council were among dozens of organizations that passed resolutions opposing conscription. On January 25, 1916, the United Federation of Labour convened a conference of its members on the question of conscription, which was attended by over 200 representatives of unions and labor organizations. Only a single delegate spoke in favor of conscription. Women delegates gave speeches against the increasing attempts of employers to exploit women’s labor, and lower wages paid to women. They declared themselves against division between the sexes in the working class movement and for internationalism. Ex-soldier delegates also spoke, exposing the self-serving intent of the generals that favored conscription and noting the use of increased bodies of soldiers to suppress strikes, as had happened in Bermuda when black colliers struck. The outcome of the conference was a manifesto that stated the principles of the anti-conscription movement: opposition to the conscription of life, demands for the conscription of capitalist wealth, wages for soldiers set to the level of the highest skilled artisan, higher pensions for disabled men, orphans and widows, and the statement of the Allied Nations terms for peace. The movement was also egalitarian and internationalist. The fight for women’s liberation was made all the more urgent by the war, and union papers like The Maoriland Worker carried articles specifically on issues that most affected women, as well as agitating for organization of women workers. Pains were also made to point out the international nature of capitalism and the need for solidarity with German and Austrian workers. The anti-conscription manifesto itself carried an extensive quote from the German Socialist Wilhelm Liebknecht. Nevertheless, the government was determined to push through with conscription. The Military Service Bill was introduced to Parliament at the end of May 1916. Organized labor had long anticipated this moment, and set about an uproar. Mass meetings up and down the country denounced the bill at its first reading, its second reading and its final enactment. Anti-Conscription Leagues were urgently formed in Auckland and Wellington, spreading later to other centers. As the bill proceeded through the House, the mass meetings began to take on the character of spontaneous demonstrations. Alexandra Hall in Wellington was filled beyond capacity and demonstrators flowed onto the street outside, where the likes of Bob Semple and Adela Pankhurst rallied the crowd. Further outdoor demonstrations stopped traffic at Cuba Street and at the busy intersection of Lambton Quay and Willis Street. The outdoor demonstrations brought the class nature of the state out in the open for all to see. The police attempted to suppress the trade union demonstration at Alexandra Hall, but refused to interfere with the demonstrations at Cuba Street and Lambton Quay, where Tory and Liberal Politicians were allowed to speak. In rural towns, too, there was uproar. 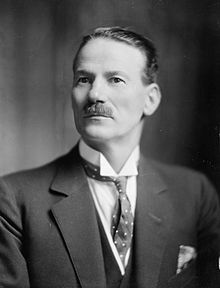 Record meetings were held in Dargaville, and Thames was unanimously against conscription. Rural workers in Canterbury also declared their opposition. Despite the opposition, Parliament was set in its purpose – to force men to the front. An unholy alliance of the Liberals and Tories, once the stalwartly opposed, rushed the bill through in a matter of days. Only four M.P.s from the socialist movement and one left-leaning independent opposed the bill at the final reading, and conscription was enacted on June 9th, 1916. After a period of relative quiet, the anti-conscription movement received a boost when Australia voted ‘No’ in a referendum on conscription. Over the Christmas period, large meetings for the conscription’s repeal were held in Auckland, Waihi, Wellington and Christchurch, as well as other locations. But this time the government was ready. Veteran activist and organizer Robert Semple was arrested ahead of his speech in Christchurch, charged with sedition, and sentenced to one year’s hard labor. Semple’s jailing set a precedent. Within a week, five of the most prominent union and anti-conscription activists were arrested, tried for sedition and uniform sentences of 1 year’s hard labor imposed. The offices of the United Federation of Labour’s newspaper The Maoriland Worker were raided by police, and a Justice of the Peace suggested one of arrested editors might be hanged. New war regulations were pushed through, giving the police the power to ban any meetings against the war that “might be injurious to the … interests of His Majesty”. The bourgeois press played its role too, inciting jingoist hooligans to anti-conscription meetings of balloted men in Christchurch. Their spinelessness was shown when only a small group attempted to disrupt the meeting, although the police – who were also present – turned a blind eye. Immediately following the arrests, workers’ organizations began a ‘freedom of speech’ movement, agitating for the release of all those arrested under charges of sedition and collecting funds to support the families they left behind outside. Strike! Coal miners out against conscription! On January the 30th, 1917, coal miners on the West Coast began a ‘go-slow’, demanding higher wages and the repeal of conscription. As the ‘go-slow’ became a total stoppage, the strike spread throughout mines covered by the Miners’ Federation until nearly the entire coal- and gold-mining industry was shut down. Despite the arrest of nearly a dozen union officials, the strike continued and gained the support of several other of the more militant unions. Australian miners declared that they would strike if attempts were made to supply New Zealand with Australian coal. Acting Prime Minister Sir James Allen was forced to intervene when Waterside Workers in Wellington threatened a wider strike and refused to unload ships carrying the vital fuel. After nearly three months on strike the miners won an important victory. The government agreed not to press for penalties against those arrested in connection with the strike, and to allow the appeal of “every essential worker in the essential industries in coal and gold mining”, should they be balloted. Although not the full appeal of conscription they had fought for, it was an important gain nonetheless, as important battles had been fought behind the scenes for the exemption of workers in ‘essential industries’. By taking action, the miners had set a precedent. It remains to be said about the plight of those who were conscripted against their will and refused to go. By the end of the war there were between some 300 and 400 such conscientious objectors doing time in prison or labor camps. Only a small number of people who belonged to relatively small denominations or certain occupations (such as the police) were exempt. All others who were caught resisting the call-up we given sentences, which lengthened from 28 days to two years as the war, continued. In July 1917, it was decided that an example would be made of the most recalcient objectors. 14 objectors were loaded on the transport ship Waitemata, and deported to the front lines in France. On board the Waitemata, the prisoners were placed in a cell without ventilation or a bucket for sea-sickness, stripped and forced to wear uniform. Three became so ill that they had to be left behind in Cape Town. Another fell in ill in Plymouth, England, but the remaining 10 were sent to France. Upon arrival in France, several of the objectors were threatened with execution if they continued to resist. After some time in hard labor, three of the objectors, Mark Briggs, Archibald Baxter and Lawrence Kirwin were sent to the front. Others became stretcher bearers, one of whom was tragically shot only two days after beginning service. After resisting beatings, forced labor, shelling and ‘Field Punishment No. 1’ (being bound and tied to a post for periods up to four hours) to the end of endurance, Baxter and Briggs were eventually classified as unfit for service and transferred to field hospitals before being returned home. In New Zealand, resistance continued. After the 14 famous objectors were sent to France, the uproar was such that the government was forced to deny it ever had a policy of deporting objectors. In the prisons, hunger strikes and other forms of disobedience were the methods of resistance. A hunger strike by objectors in prison at Waikeria in 1919 developed into a strike against the whole prison system. At Papanui a strike occurred when a prisoner from the West Coast refused fire drill duties and at Kaingaroa Prison prisoners disregarded orders not to remove their blankets from their beds on cold days when they weren’t working. When one objector imprisoned in Waikeria needed to see his ailing wife, he struck food and work and was ‘locked up’. Another prisoner supported his cause and after 7 days he was transferred nearer to his home in Wellington. To conclude the story, a few words have to be said of its significance. It is important to remember the real history of the First World War, not just to set the record straight, but because it’s vital to recognize just how far those that rule the world are prepared to go in order to defend their power and wealth. They sent the working classes of the world into the trenches to be murdered in their millions. But beyond that, all the rhetoric of ‘freedom against tyranny’ is made manifestly false when we remember the all out assault on democracy on the ‘home front’. When the socialist M.P. Paddy Webb was jailed for refusing to report he was told the military authorities did not “think that Parliament can be regarded as essential… that the men at the head of affairs are capable of governing the country”. That statement alone should stand as a warning to all who stand in the cause of freedom – that is why it is so important to remember what the First World War was really like. If, when the troops parade down the streets on Sunday, we forget the thousands of workers, soldiers and sailors, men and women who resisted, then we truly have forgotten. But that’s what our rulers – the heads of the army and the police, the politicians – Liberal and Conservative alike – wanted all along.